Sorry for the massive wait on Issue 5. It’s taken longer to put this issue together than we’d normally like. Good news though! 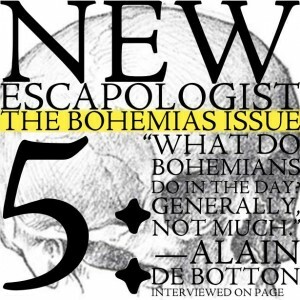 The issue is at the printers and should be delivered to New Escapologist HQ within the week. All being well, it’ll be in the hands of subscribers and those who pre-ordered very soon indeed. Issue 5 features Jacob Lund Fisker; Alain de Botton; Dickon Edwards; Neil Scott; Jason Botkin; Reggie C. King and many other fabulous Bohemian writers and artists. We also have a striking new cover format, and its our chunkiest issue to date at 106 pages. You can still pre-order Issue 5 for a modest £6 (€7.80/$10) at the shop.